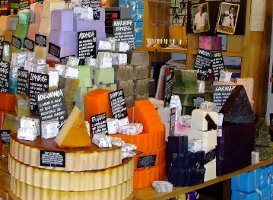 Lush began as Cosmetics To Go in 1988; the UK-based company, founded by Mark and Mo Constantine, was reconstituted as Lush in 1994. By 1997 they had 19 stores, by 2015, they had 900+ boutiques and spas worldwide. The Lush company espouses environmental activism and frequently donates a percentage of proceeds to environmental and/or humanitarian groups. They are also routinely included on lists of "best companies to work for". Lush specializes in eco-friendly soaps and bath products, and features fun — but minimal — packaging and quirky names (Demon in the Dark soap, You Snap the Whip body butter). Fragrances come and go, although the best-seller Karma is usually in production. Other fragrances include Go Green and a new solid perfume range (2007, see reviews of Silky Underwear and Potion), The Olive Branch, Sakura, The Comforter & Snow Showers (2008), Vanillary (2009), So White & Candy Fluff (2010). In 2010, the perfume line was reorganized under the name Gorilla Perfume at Lush (see below). At that time, a number of older Lush fragrances and some fragrances from the brand's discontinued 'sister line', B Never Too Busy To Be Beautiful, were added to the range, including Ginger, Flower Market, Icon, Vanillary and Karma (all from Lush); and Dirty, Ladyboy, 1000 Kisses Deep, Dear John, Cocktail, Breath of God, Inhale & Exhale, B Scent, Superworld Unknown and Love (all from from B Never). See also body product reviews for Don't Rain on My Parade Shower Gel, Rosy Cheeks Fresh Face Mask, Snowcake soap and Smitten hand cream, Bathos Bubble Bar, Lush Charity Pot, Jasmine & Henna Fluff Ease, Sonic Death Monkey Shower Gel, Handy Gurugu, Rose Jam Shower Gel, Flying Fox & It's Raining Men Shower Gels, So White Shower Gel and Yog Nog soap, Prince Charming Shower Gel, Sunny Day Anti-Static Hair Detangler, Sleepy Hand and Body Lotion & Serendipity Soap, Wash Behind Your Ears Shower Gel, Wash Cards in What Would Love Do?, I’m Home, Amelie Mae & Cardamom Coffee. Gorilla Perfume at Lush was introduced in 2010 with the new fragrances Tuca Tuca, The Smell of Freedom, Orange Blossom, The Smell of Weather Turning, Lust and Imogen Rose. Later that year, they added Smell of Freedom Part 2 & Smell of Freedom Part 3. At Lush boutiques or selected Macys stores. See all articles on Now Smell This tagged Lush or B Never. Read Lush couple with a shed load of ideas at the Guardian.